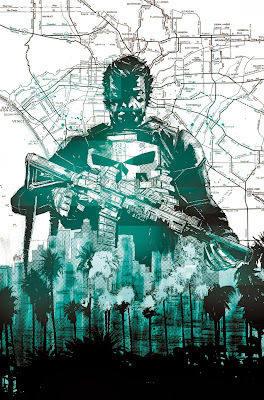 As well as writing the just announced Black Widow series, Nathan Edmondson will join artist Mitch Gerads on February's relaunch of Punisher. Now based in Los Angeles, Frank feels he has found the head of the crime snake in the city of angels. Zeb Wells wrote her in Savage Wolverine with artist Joe Mad, now he's taking Elektra back into her own solo title. Part of Marvel's thrust into female led titles, the infamous assassin kicks off next March with Mike Del Mundo handling art chores. One of my main addictions of the 90's, The New Warriors also gets a revival. In February founders Speedball and Justice assemble the new Nova, Scarlet Spider, Sun Girl, Inhuman Haechi, Demi-God Aracely, and Atlantean Water Snake, as they are deemed a threat by the High Evolutionary. Aiming for a Wolfman/Perez Teen Titans / Brian K. Vaughan's Runaways mix, the series launches in February from writer Chris Yost and artist Marcus To. Lastly, Captain Marvel gets a relaunch, showing the company's commitment to Carol Danvers, hoping to expand on the low sales of her last series. 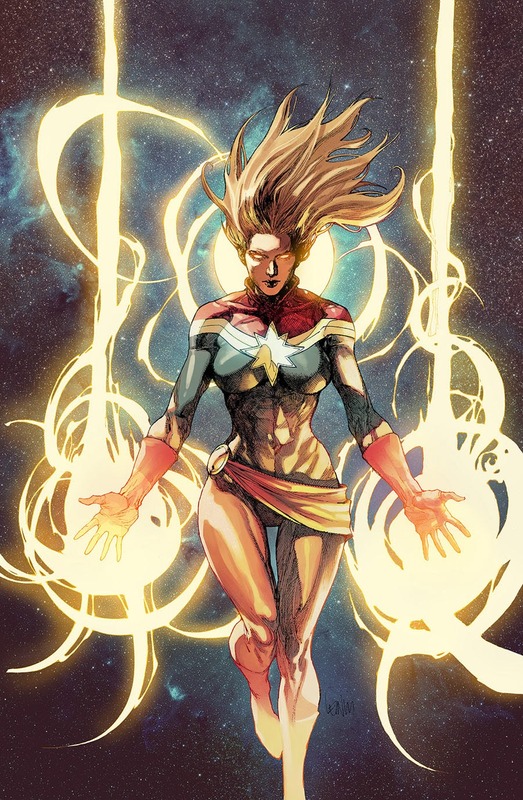 In March the new run's mantra will be Higher, Faster, Further, More as writer Kelly Sue DeConnick takes Captain Marvel into space. My idea to upping Carol Danver's numbers? Put her back in the old suit. People don't know who she is in this one. Plus, the other one is just cooler. But that's a quick fix, they also need a good, engaging plot that sells not just to girls, but girls' dads or moms. Because we're the ones who pick out the comics for our daughters and sons. I love that Elektra cover. New Warriors was one of my loves as well, along with Guardians of the Galaxy (back when Vance was in both). But the only way to get Vaughn's readership is to get Vaughn. If they want that demographic, they'd better not screw around with a lot of juvenile horsehockey. Some jokes punched in are good, but too many and it's boring. Unless you're going for a gag book, I like those too. But I can't buy the whole print run. I just don't want it to turn into Teen Titans redux. Where the kids are all angry and stupid. I agree with the Captain Marvel suit thing Random. I think the blue and gold lightning bolt is a comic classic. As for what would make her sell more I think you're right there too. Plus she needs to concrete her backdrop. When I think Danvers I think Binary/special agent/Kree/Avenger. And it's a bit all over the place. What is her core identity and what areas of the Marvel U can she explore that every other book can't? Then you have a series. What I liked about Wells take on Elektra in Savage Wolverine is that she hardly spoke. That is how an assassin should be! Hopefully it gives the same feel here as it did in that great arc. 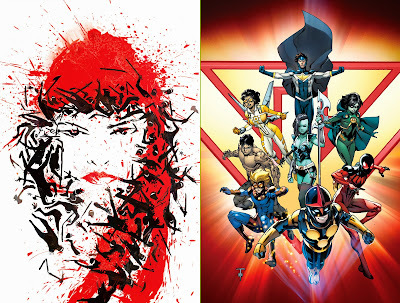 What always worries me about New Warriors revivals is a) people seem to stay away from bringing back the core Fabian cast, which is really what the old fans want - sure Namorita and Nova are dead and Firestar is in the X-books, but Sil, Turbo, Darkhawk, Night Trasher and Rage are still outthere and if Wolverine can be everywhere I'm sure Firestar can be in two places at least. Sure new characters are welcome, but I'd still have stack my bases with returnees. Secondly) Fabian's series was pretty dark and people relaunching seem to forget that. Namorita got beaten to a pulp by Sea Urchin, Justice killed his abusive father, Rage's gran was murdered by a gang who gained their secret identities through a one night stand with Nita, and more - writers just have to remember sure the team takes a bright photo, but the brighter the picture the darker the negative, and that mix is what made the original fly. Still I'm in. I can't not be. New Warriors are my team.